Sometimes these restaurant visits are planned, sometimes they’re on a whim based on what’s near where I need to be for a story assignment and once in a while they become even more random. Needless to say, this is among the latter. A friend and I had planned to meet at a Chinese restaurant in Claremont on a certain Wednesday, but when we got there we learned it’s closed on Wednesdays. He suggested a Chinese restaurant in Rancho Cucamonga in the 99 Ranch center that he’d tried and liked. We each drove there and learned that it, too, is closed on Wednesdays. What were the odds? Before that day I knew of only two restaurants that are closed Wednesdays, Vince’s Spaghetti in Ontario and Mariscos Jalisco in Pomona, and suddenly that number doubled on one lunch break. 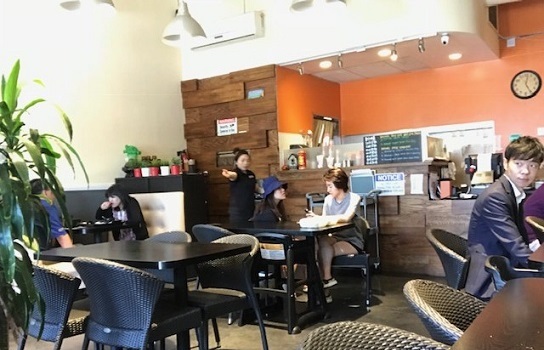 But I noticed the Taiwanese restaurant Mimi 5 Bobee in the same center, and my friend hadn’t eaten there before either. It’s the only restaurant of four in that center neither of us had tried. So, undeterred by the name, we went in. It’s a small, but large enough. We examined the menu and selected two items. First was chili pepper wonton ($7.50), a decent version of a favorite dish, pork dumplings in chili oil. We also got pork stew dry noodle ($7), wisely upgrading to hand-pulled noodles ($1.50). 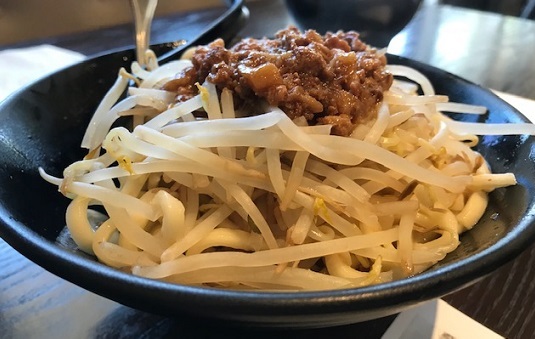 The ground pork was lightly spiced, the noodles stretchy and chewy. This proved to be our favorite item. Those two orders weren’t enough for two people, so after some consultation with the server, we got pork in red grain with rice ($9). (They are big on pork here, and I guess we, too, were big on pork here.) It was deep-fried, quickly, and came with cabbage and carrots, jicama (or something like it) and a hard-boiled egg, and rice with a bit more pork. We liked this as we had the others, but the noodles remained our favorites. We also got milk tea drinks off a specials board, two-for-one. 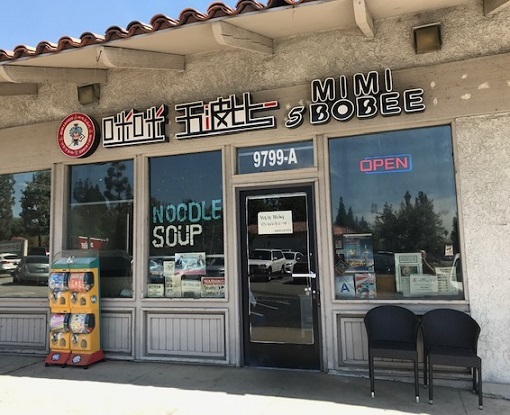 Mimi 5 has locations in Diamond Bar and Rowland Heights. 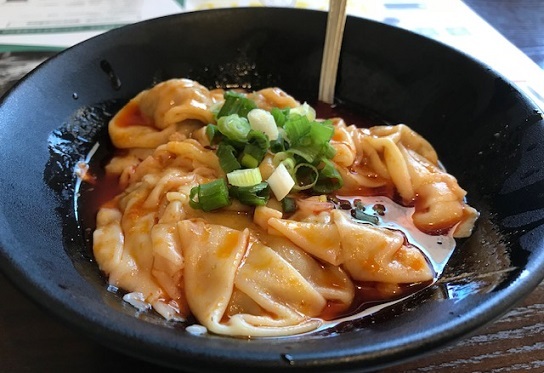 The Bulletin’s real reviewer, David Cohen, wrote in 2016 that specialties include stinky tofu, marinated pork and oyster pancakes, among other dishes not commonly available in the area. 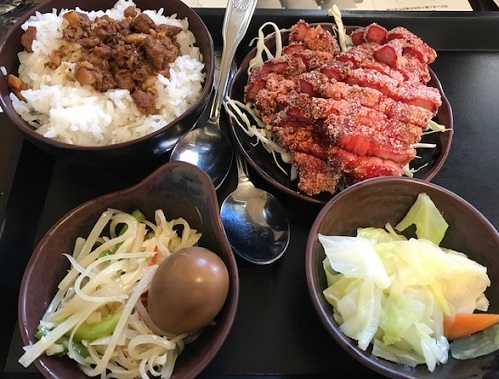 I’ve been to Red Chilli House, Lotus Cafe and Min’s Dumpling House in that center and have enjoyed them all, with Min’s and Red being the standouts. Still haven’t ventured inside 99 Ranch, which has its own food court. And of course I need to try the new spot that is closed Wednesdays — but obviously should not do so in midweek. This entry was posted in Restaurants: Rancho Cucamonga and tagged Chinese, Rancho Cucamonga, restaurants by David Allen. Bookmark the permalink.